This summary provides an overview of projects that are in progress or are being planned. with an outline of your idea. We look forward to developing the idea with you further. Purpose: To demonstrate best practice that delivers improved productivity and product quality by enhancing the quality of the soils and building resilience to changes in climate and weather. Approx. value: up to $400,000 over 4 years. A summary of the key findings is available in the January 2014 newsletter. The project is producing detailed, practical canopy management guidelines for the main Wildflower crops grown in Australia. The project is focussing on the top 30 products identified by the industry for PRJ 000331, which defines quality specifications for these top products, but other flowers may be included. This project is being done in 2 stages from 2010 to 2012. Canopy management workshops were conducted in various locations. Each presented general information on pruning and canopy management plus the specifics of managing particular species. The information is currently being collated to create a grower manual. Please direct any enquiries to the project manager, Dr Audrey Gerber (audrey@gerbermail.com.au). Recent gains achieved in the wildflower industry, including the formation of a national industry body in WFA, and the successes of current and recently completed R&D projects, have been developed into programs and strategies to get these COMMUNICATED to and USED by industry stakeholders, including growers, marketers, florists and allied industry members. This project is now complete; stage 2 commenced on November 30 2014. A report on progress during 2013-14 and key findings is available below. Purpose: To build awareness and appreciation of Australian grown wildflowers among florists in training in a competition setting. 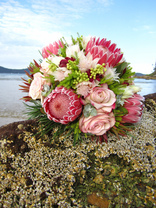 Each year WildFlowers Australia Ltd hosts a national student floristry competition where students are invited to submit photographs of their design on a specific theme. Each year has a different theme.